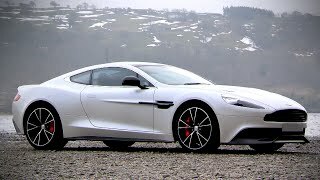 After roughly 6 years since it has been replaced by the DBS, the Aston Martin Vanquish 2013 is set to hit the automotive market later this year in order to come full circle and replace the DBS. Initially the new Vanquish made its first appearance bearing the name of "AM 310 Concept" at this year's Concorso d'Eleganza Villa d'Este where we've also had the chance to see the BMW Zagato Coupe Concept 2012. However, unlike the Zagato which is a one-off car, the AM 310 concept will become a reality. Under its hood the 2013 Vanquish will sport a 5.9 liter V12 engine developing 565 horsepower, 457 lb-ft of torque and a soundtrack like no other with the help of the stainless steel exhaust system featuring active bypass valves. The unit will be mated withAston Martin's Touchtronic 2 six-speed gearbox whilst the six-speed manual transmission will not be an option anymore. The Touchtronic 2 gearbox will send the power to the rear wheels and coupled with theV12 it will be able to make the 2013 model go from 0 to 60 in just 4.1 seconds, with a top speed of 183 mph. 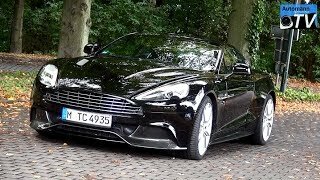 In terms of design the new model retain the overall looks of an Aston Martin, featuring familiar shapes around the front grille, the headlights and the C-shaped taillights, and for those who are not actually familiar with other AM models or can't call them by name at first glance, the Vanquish will look as any other Aston Martin but with a beefy body kit thrown in the mix. However, that's all it needs in order to look astonishing. Underneath the magnesium allow, carbon fiber and aluminum bodywork resides a strong bonded aluminum and carbon fiber structure, and even the exterior even shows a few carbon fiber elements on the front bumper, at the rear and on the side-skirts. On the interior the Vanquish 2013 manages to impress with its high level of luxury and it offers five different color schemes including Winter Wheat leather with Chancellor Red stitching and carbon fiber elements on the dash, Obsidian Black leather with yellow stitching and Carbon fiber elements, Kestrel Tan leather with silver stitching alongside –once again- carbon fiber dash elements, Spicy Red leather with silver stitching and Piano Black dashboard and last but not least, Tuscan Tan leather with cream stitching and Piano Black dash. Furthermore, the new Vanquish will be offered as a two-seater, but as an option you can choose a 2+2 configuration. 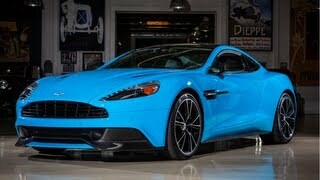 As far as pricing and availability goes the new upcoming Aston Martin Vanquish 2013 will be available for purchase in the UK later this year at the price of £189,995 (around $298,800) and it's expected to hit the dealerships in the US sometime earlier next year. Are you excited about the new model? Will it make a bigger impact than the Ferrari 458 Italia or the Lamborghini Aventador? We'll have to wait and see.